Dyslexia though not common affects children nowadays. It is also named as trouble reading or reading disability. It is quite disturbing to have a child with dyslexia. It affects his or her learning or reading capabilities. It does not mean the children affected by dyslexia are not intelligent. They are intelligent as it does not affect their intelligence levels. Dyslexia does not result from low vision or low laziness. It only affects his or her brain perception of certain letters with their associated sounds and in some cases it also affects their spoken language. Dyslexia does not affect the future of the children affected by it. It needs constant care and the children must be taught differently so as to make them understand the letter and sound formation. The children affected by dyslexia can still comprehend very hard concepts but it only takes a long time. They can resort to hearing audiobooks rather than reading books. Once if a child is diagnosed with dyslexia, it cannot be outwitted but it can be adjusted, that is, by means of effective means of several strategies and plans the child will be taught to cope with the problem and to see the problems differently. Dyslexia lowers the esteem and confidence of the children because they repeatedly try to beat the bush that is an impossible task. Many famous personalities like Steve Spielberg and actress Whoopi Goldberg etc were all affected by dyslexia. It seems the people affected by dyslexia are creative. To the children affected by dyslexia reading a single letter or understanding a single paragraph to grasp its meaning is very tedious. So in order to have a clear comprehension of the problem we must know what makes them different from us. Each letter associated with a certain sound. The dyslexia victims must be trained to recognize the letters and their sounds to have the correct guidance. The child must be guided to sound separate individual words rather than whole sentences. Because it is easy to teach them small concepts rather than sentences. After regular practice the child will be able to sound or pronounce words or sentences correctly. People will be familiar with a word once they see it for a time or two. The next time if they see it the will be able to recognize it. But it is not so with dyslexia victims. They needed to see it atleast fifty times to grasp the word. So practices must be given to them. Average people read a paragraph fluently. They can also be able to spell unfamiliar strange words to an extent. So practice must be given to the victims to enable them so as to make them read fluently. For normal people it will take about a single reading to understand a passage and to recall the ideas later. But for a dyslexia victim it takes about some ten readings to grasp the meaning. Even then they cannot grasp the meaning. So if a child is suffering from dyslexia it is mandatory to take him to a doctor. Though the exact causes for dyslexia are not found some reasons are speculated to be the cause of the disorder. If any child is affected by dyslexia there are chances for the child to have inherited it from his or her relatives. And the child may be susceptible to pass it on to the next generation. Though not an exact reason it is generally regarded to be so. The hereditary factors affect the reading and speaking capabilities of the children. It has been estimated in the USA that about forty percent of the total children affected by dyslexia have got it transferred to them by genetic issues. The child affected by dyslexia is bright like all other children but the only difference is his brain functions in a slight different way than the rest. In normal people the dominant side of the brain that is the left side of the brain for the right handers will be remarkably higher than that of the recessive one. But in the case of the dyslexia affected children both the hemispheres of the brain are the same size. This impairs their reading and speaking capabilities. For the people to recognise and speak words the certain parts of the brain have to work respectively. In the case of the dyslexia affected people the brain uses different parts of the brain to compensate for the impairment because all the parts of the brain do not work in the same way. But with proper training the brain parts of the children can change accordingly. This is known as neuroplasticity. The brain functions change after responding to the therapy. The nerves in the brain rewire themselves and help in the curing of that condition. The symptoms of dyslexia vary from person to person because not all of the children are affected alike. Some children experience learning and writing disabilities. They find it difficult to pronounce words correctly and write some words. Others find it difficult to speak correctly. The condition impairs the sentence formation making it difficult for them to form sentences while speaking. Though dyslexia affects the kindergarten children, most of the children experience it even in their grade schools. Some children get confused with the navigational directions such as left and right. Using a buddy can be helpful sometimes. People affected by dyslexia find it difficult to manage time. So keeping an alarm clock can save the trouble. There is no single test for dyslexia. 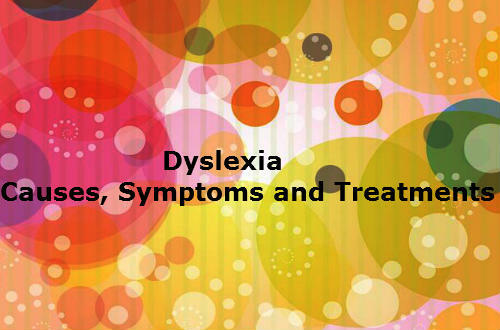 The treatment involves a series of tests to identify the problem of dyslexia. The treatment involves extending more free resources to the child to help him or her learn the correct way. This contains no invasive procedures but involves testing the child’s learning and speaking capabilities. The parents are needed to answer questionnaires related to their child’s intelligence. Based on the answers the doctors treats the child and decides the necessary treatment to be taken for the child. The doctors talk with the child and collect informations about what it feels about it and perform medications accordingly. After the doctor has examined the child he refers a professional who builds deep insights into what the child is struggling from. He then zeroes onto the problems of the child and prepares a record to be given to the doctor. The specialists based on the reports of the doctor and psychologist build a treatment plan and treat the child considerably. The weak area of the child is then found and treated accordingly. It is never late to check the abilities of a child to treat him. The sooner we diagnose the conditions the sooner we will treat him.